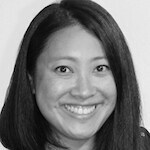 Elaine Chang is senior manager, global market development, for TaroWorks, a social enterprise launched by Grameen Foundation to sell mobile data collection and analysis, offline CRM and field force management tools for use in developing countries. Financial diary methodology is a powerful tool for studying financial inclusion, especially if digital tools are used. Using a mobile data collection and analysis app (which also worked offline) and a cloud-hosted database, Catholic Relief Services drew household data from rural areas in real time and amassed thousands of data points generated by tracking people’s financial lives each week.